The use of deeds is common in commercial transactions, so it is important to understand how to execute them correctly. There are strict requirements and if an individual, partnership or company does not follow these requirements, a court will not enforce the deed. This article will set out the process of correctly executing deeds for different business structures and arrangements. A deed is a binding promise or commitment to do something. It is important to note that deeds are different from agreements or contracts. At its simplest, the main difference between a deed and an agreement or contract is that a deed does not require consideration (i.e. the exchange of something valuable such as money) to be binding. the intention of the parties to be legally bound. As deeds do not require consideration, the parties’ intention to be bound by the deed will depend more on whether the parties have completed the deed correctly rather than surrounding circumstances. Therefore, deeds have strict execution requirements, and individuals, partnerships and companies these must complete them correctly or the deed will be unenforceable. be delivered to the other party to the deed. Nowadays, execution blocks on deeds (where the parties sign the document) state that the party has “signed, sealed and delivered” the deed. As such, you do not need to have a seal physically placed on the document. Delivery refers to the date when a court will consider that a deed is effective. From this date, the deed will bind the parties. However, there is typically no requirement to actually deliver the deed from one party to another. In most cases, a court will presume that a correctly executed deed has been ‘delivered’ unless circumstances show otherwise. It is also important to be aware that the execution of deeds for certain types of transactions will be subject to particular requirements under legislation. For example, in New South Wales (NSW), a deed passing an interest in real property has specific execution and witnessing requirements. The execution of deeds by individuals should include the individual’s name and their signature. Many states and territories have legislation which explicitly require that someone witnesses the signing of the deed. However, even if the laws of your state and territory do not require witnesses, it is still best practice to have a witness, as it serves as evidence of the actual execution of the deed as it appears. The witness should be a third party who is not a party to the deed. all partners executing the deed on behalf of the partnership. With deeds, a partner must have explicit authority from a separate deed to sign on behalf of the partnership. This is different from agreements where a partner is generally presumed to have the ability in law to execute on behalf of the partnership. This authority can be set out in a power of attorney or partnership deed. If the above two methods are not appropriate or possible, a deed may be binding where a partner has executed the deed in the presence of all other partners. When a partner is executing on behalf of the partnership, a third party should witness the signing, as many state and territory laws require this for the execution of deeds. Furthermore, a person witnessing the signing is recommended best practice even if it is not strictly required. The most common way for companies to execute deeds is to follow the methods set out in the Corporations Act. Executing deeds in accordance with these methods is useful and reliable. This is because the Corporations Act states that if a deed is executed in these ways, the court will presume that is has been correctly executed, unless the parties knew or suspected at the time of dealings that the assumption was incorrect. Deeds require an attorney to be appointed by a separate deed. This deed must grant that person an explicit ability to execute deeds on behalf of the company. This is different from agreements where companies may appoint agents or authorised representations by way of a board resolution to sign agreements on behalf of the company. Trustees execute deeds on behalf of trusts. 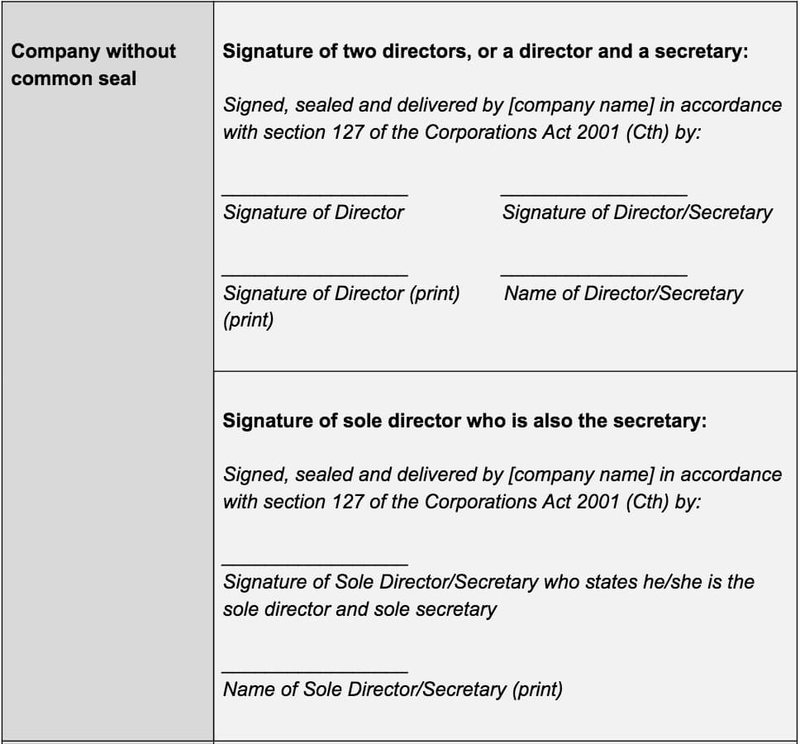 The method of doing so will depend on whether it is an individual trustee or a corporate trustee. The way individual trustees will execute deeds is similar to individuals. Likewise, corporate trustees will execute deeds in a similar way to companies. The execution block should explicitly state that the signatory is executing the deed in its capacity as trustee, or “as trustee for” (‘ATF’) the trust. Whenever a trust is looking to sign a deed, the trust deed should be reviewed to ensure the purported trustee has the authority to execute the deed on behalf of the trust. For a deed to be valid and enforceable, the law requires that individuals, partnerships and companies follow certain formalities. If your business is executing a deed, make sure you understand the capacity in which the signatory is signing the document and if that person has authority enter that transaction. This is especially important if executing the deed on behalf of a business entity, where more complicated processes may apply. If you need advice on a deed or how to correctly execute one, you can contact LegalVision’s contract lawyers on 1300 544 755 or fill out the form on this page. Out of Court Settlements Part 2 - What is a Deed of Settlement and Release?